PITTSBURGH — A commencement speaker at Point Park University here urged graduates to brush their teeth. Whether she was grasping at a clever metaphor for handling life after college or she actually felt that a diploma along with good dental hygiene were keys to happiness, I couldn’t tell. 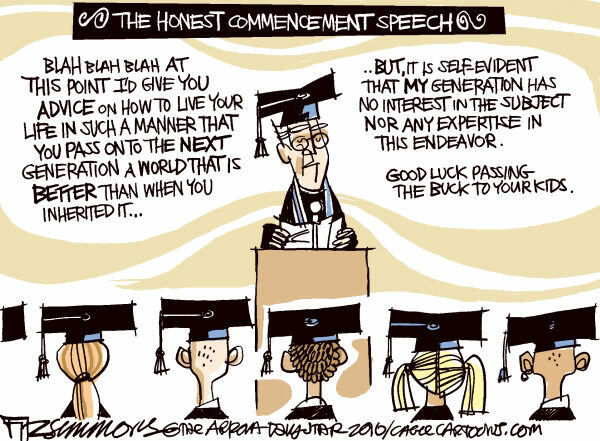 Commencement speeches come in many flavors. —Read a newspaper. Also, watch C-SPAN periodically, become a fan of “60 Minutes,” and try listening to NPR. The more college students I speak with, the more alarmed I become about the general disregard for current events. I don’t mean what’s trending on the Internet or what’s hot in Hollywood, I mean real news. If you truly hope to get ahead, keep up with the information you ought to know — not just the material you want to know. —Limit mobile devices. At Point Park, administrators were compelled to warn students not to use cellphones while crossing the stage to receive their diplomas. They should have extended the ban to the seating areas, where thumbs tapped furiously throughout the speeches. Instant communication has revolutionized our lives and your generation, but don’t let it become an obsession. —Go slowly. Sure, you want a good career, a lot of money and a family of your own. But if those things don’t present themselves immediately, then get a paid internship, work for a non-profit, or be a volunteer if you can afford to. Do the things that many of us wish we had done after college, and then found too difficult to arrange once our lives became more complicated. —Call home. After college I went for almost a decade in a self-absorbed world of my own. I felt I didn’t need help with life, and I took that to mean I could drift away from my family. Big mistake. The time is precious and if you squander it now, chances are you’ll regret it later. Being independent doesn’t mean cutting family ties. —Vote. Now there’s an unusual piece of advice for college grads, but it’s troubling to learn how many people in their twenties aren’t registered and don’t vote. Sometimes it’s because they are transplanted to new communities; or, it’s just a conviction that a single vote won’t mean anything. Voting is not only your civic responsibility, it actually makes you feel good when you do it. —Get over yourself. At graduation they pump you up because you’ve earned it. Now, get real. The diploma counts for a lot, but it doesn’t mean you know it all — or even a small part of it. View the next phase of life as an even greater learning experience than the one you just went through. In fact, if you really want to help your own cause, sign up now for that literature class you were afraid to take last year because it might have hurt your GPA.